When I arrived as a freshman in Secondary School in 1972, the senior prefect at my school was Snr. Lovi Mawunya. I kept wondering to myself how someone will travel the distance from Volta region to come to a sleepy Bono town for school. Later on in life I would come to appreciate that the expansion of the boarding school system through the Ghana education trust was perhaps the greatest legacy of our first president, Osagefo Dr. Kwame Nkrumah. If you look across our sub region and see how ethnic and religious intolerance is tearing up communities around us one thing can explain how Ghana escaped this scourge; education. The vision to bring diverse groups of tribal and religious backgrounds together through the power of education has served this nation well. At my school, this was the time when students of all tribes and religious backgrounds; Ga Gonja-Dagomba, Ewe, Ashanti Fante Guan would arrive at Techiman to enjoy the Annual Apoo festival and to socialize with friends in the town weeks before school reopened. My friends still call to inquire about the Apoo festival. But today this noble vision is under assault as politicians and unscrupulous academics have invaded our schools in an attempt to recruit our youth into a dangerous tool as ethnocentric and puritanical crusaders. Instead of the good old days of academic clubs and fraternities that promoted education, today’s institutions have seen the proliferation of ethnic and political based clubs TEIN, TESCON, Ashanti Students Union, Volta Student Union BASU etc with the sole aim of promoting ethnic identity. If our honorable members of parliament today are making dishonorable comments about tribes it is because of the mistakes we made as a nation in allowing politicians to enter the most forbidden part of our society; the classroom. And so today’s Ghana, some speak of Ewes as if they are some alien tribe who just showed up at our doorstep, unwelcomed and unappreciated. Some peoples still do not want to accept Ewes as Ghanaians. Anytime I go to Aflao and look across the border to the other side, I am reminded of the tale of two cities and my respect and appreciation of Ewes ever grows stronger. Here (Aflao) is a piece of real estate that could well have a priced suburb of a state capital like East Lagon or Adjiriganor in Accra. The chiefs and people of Aflao could be making millions from selling land to well resourced businessmen, Kings and Sheiks who would pay any money to live in the bustling suburb of Lome. Yet in the plebiscite of 1956 the people of Aflao as did other Voltarians chose to be part of a country that does not even seem to appreciate them. Recently the President of La Cote Ivoire has been making noise for not being consulted enough on the construction of Bui Dam, a dam that is twenty five miles well within the borders of Ghana. Imagine trying to build a dam at Akosombo on the Volta River when the Volta River is the international border between Ghana and Togoland. Volta region is the life blood to Ghanaians. And so we talk of Ashantis as if they are the source of all our problems as a nation. Some people have made a successful political career from bashing Ashantis. It does not matter to them if Ashantis are perhaps the most welcoming, inclusive and enterprising people in Ghana. Accra is the seat to government and that explains why people are drawn to our political and administrative capital. Besides that there is not a single town/city that has the attraction and preeminence that Kumasi has in Ghanaian society. The president of Mali on a visit to Ghana intimated to our president that he was a proud Kumasi boy. The sad part of this is that many of those Ashanti haters are people with strong roots in Kumasi because of trade, education and religion. The most ardent of these critics are second or third generation non Ashantis whose parents arrived at the capital of Ashanti region as economic refugees. Today their fortunes have turned, they sit in their penthouses and shout the loudest insult, cast aspersions and scorn the very base that offered them the shoulders to climb on. Other unsavory comments are made of Fantis, Northerners and my Bono people. But could it be true as some have already indicted our generation, that the more education we got the more egocentric, spiteful and corrupt we have become. My father had a canny way of breaking our conversation about my education. Anytime I to tried to engage him in an intellectual debate, he will looked at me with a jaundiced eye and tease me in Bono “sukuu b?b? man; school will destroy your generation”. I know he didn’t mean it but if he did looking at what some unscrupulous academics and politicians are doing to our nation, are we not living the worst fears of the old man. So we can’t see how offensive and insensitive it is to refer another group of Ghanaians as inward looking. Last year, I went to the funeral in Takoma Park Md of a friend who was also a leader of the Ewe community of Washington DC metro the late Mr. Frank Kalipe. Not until different groups of mourners got up and danced to different tunes from Volta region did I realized the cultural and linguistic diversity of the region. In any civilized and progressive country, sociologist will be hard at work trying to find out how a region so diverse in culture and ethnicity could find a way to live out the true meaning of the phrase “out of many, we are one” as a model of our own county. When Ft Lt Jerry John Rawlings brought his reign of terror to the streets of Kumasi, we edged him on; let the blood flow. When Ashantis and their businesses were disproportionately targeted to punish and stigmatize one tribe for all the ills in society, we sung angelic verses to his name; our Junior Jesus. Today Ex-president Jerry John Rawlings, Major Boakye Gyan and a bunch of pseudo socialist who brought us AFRC PNDC regimes, terrorized our people but ended up coveting state properties for their personal use are some of the richest people in Ghana. The man who sold dog chains and “PK” to raise the capital that run a thriving business in Ghana is still reviled and demonized because of where he comes from. Because of our hatred for anything different from us, we’ve failed to acknowledge the germ others bring to this dynamic society. But as a nation have we always lived as if we were in each other’s throat? No. If you knew the modern history of Ghana very well, you would know that the peace, tolerance and unity we enjoy today was secured and perfected by people who had little education but understood the essence of good neighborliness and the value of our common humanity. The marauding slave raiding banditry of Samori & Babatu, the increasingly belligerent Ashantis and their expansionist wars coupled with the perennial Akan royal houses feuding over wealth, inheritance and succession created the largest internal migration this land has ever seen. Mr. & Mrs. Akan, the next time you meet a Voltarian with an Akan name, remember that the Togbe and the Lovi Mawunyas that you despise today may have been the very people who provided sanctuary and protection for your kin from certain death and destruction. To my Ewe brothers, please don’t let your leaders turn you into victims in order to advance their selfish political ambition. Ewes are not under threat anywhere in Ghana. In fact if you follow the smell of Yorko Garri, you will find Ewes in just about every community in Ghana, If they are under persecution, the world would have heard about it by now. On the contrary, Ewes have been welcomed and assimilated into many communities and families in Ghana. One of the first ordinances by Nana Akumfi Ameyaw III passed as Techimanhene was to amalgamate families and outlaw a reference to strangers/foreigners in his state. All foreigners living as guests to Techiman family unites were conferred with full rights and privileges of their host family. My best friend’s mother until her death last year was the matriarch of a prominent family in Techiman but she was born an Ewe. The next time you run into a Techiman native, prod them a little further for you could be speaking with a Techiman native of Akwamu, Denkyira, Ewe, Guan or Gonja-Dagomba extraction. 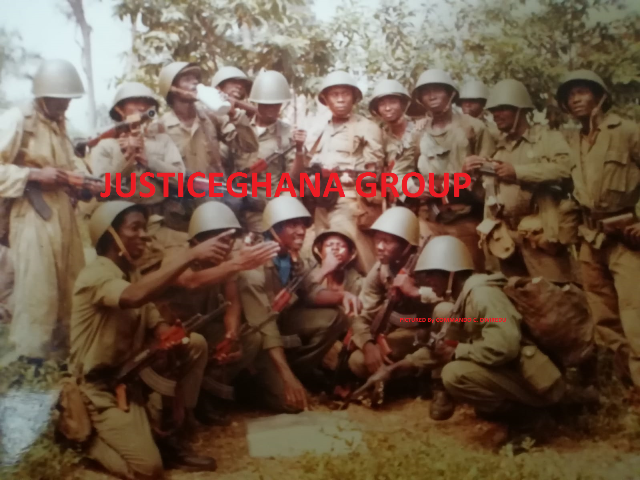 When war brought out between Konkomba – Nunumber in the summer of 1987 President Jerry John Rawlings was at his wits end. This Konkomba – Nunumba conflict was gradually becoming a national security nightmare for his government. He turned to Wenchihene for advice and was not disappointed. Nana Abrefa Mbore Bediatou IV donated land and took personal interest in resettling Konkomba refugees in what is today a thriving Konkomba farming community of Buoku Junction. This is the Brong Ahafo I knew growing up and that is why I say please don’t fight your ethnocentric battles at our backward. My Muslim Ivorian neighbors will swear to you that I am a Muslim, how else do I to know everything there is about Islam. But why should they, I am from Wenchi and Banda and Muslim cultures are very much a part of me as my Bono and Christian heritage. Growing up in Wenchi, it was a tradition for we as Christian brothers to support to our Muslim friends during Ramadan fasting season and guess who was the first to show up at the mosque to join in the celebration of Eid. As a nation we have a unique character that will make even Americans jealous about how Christians and Muslims should live together. This is why people of good conscience must stand up now and condemn the lunatic fringe of both sides who by their unguided actions can plunge this country into chaos and destruction. The sad part about this is that some of the actors of this heinous crime against our nation are people with advanced degrees in their fields of study. People who were educated at great cost to the state and mother Ghana only expected them to use their knowledge and expertise to find solutions to our national problems. They shamelessly placate their academic credentials behind their names while their contribution to our national debate is a call to arms for the destruction of the country that has wasted its resources on them. Professors who went through harrowing conditions to impact knowledge in them have now become the target of insults and vilification because they belong to a different tribe. Looking back I may have thought at the time that my father did not mean what he said but he could well have been clairvoyant in his conviction that indeed Sukuu ab?man.